Parents know all too well the way kids start school in the fall and inevitably get the sniffles within a few weeks. We all know that schools are a safe and nourishing environment, but with the spread of germs, colds, and the flu, it can be a dangerous place if not cleaned properly. 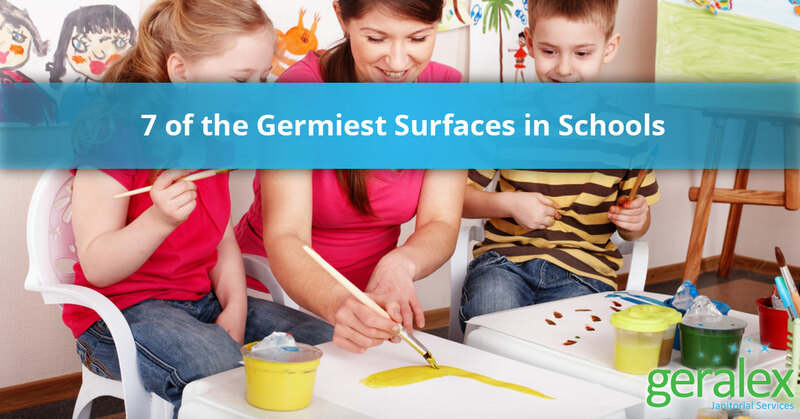 According to a study done by the National Sanitation Foundation (NSF), there are a few surfaces that children come in contact with that are smothered with germs. To protect the students of your Chicago school, Geralex, a commercial cleaning service, wants to help out by thoroughly cleaning your school and adding a layer of protection against the already existing challenges of teaching students. Whether in the classroom or in the cafeteria, water fountain spigots were found to have the largest number of germs in the two schools that were in the study. Water fountains in classrooms were the winners with nearly three million CFU, or colony forming units per square inch. These may not be cleaned as often, or as thoroughly, but whatever the reason, these spigots could definitely benefit from a little sanitization. The follow up to classroom spigots is cafeteria spigots with just over 60,000 CFU. 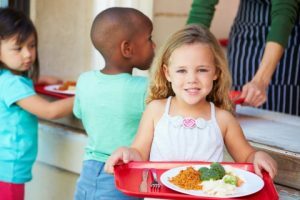 It’s probably not a big surprise that the cafeteria had a lot of germs in it — kids aren’t exactly known for having the hygiene practices. But the surfaces in the cafeteria that had a large amount of germs on them may be a surprise. Both cafeteria trays (33,000 CFU) and plates (15,800 CFU) were on the list. In some schools, it has become common for children to assist in the cleaning process after they finish their meal. Using spray bottles with cleaning solution and rags to wipe down the tables, you can imagine this may not provide the most thorough clean. Coming in at 32,000 CFU for the cold water handle and 18,000 CFU for the hot water handle, it’s hard to imagine how children at schools, and even faculty, can manage to stay germ-free. If anyone uses the restroom and washes their hands, when they turn the water off, they are instantly coming into contact with more germs. From there they go on to touch door handles, lockers, desks, and more. The faucets weren’t the only surface in bathrooms that are covered with germs. Even though it’s toward the bottom of the list, the toilet seat at 3,200 CFU is still one of the more germ-covered surfaces in a school. Because germs can live on a surface for more than two days, even with the help of a janitorial cleaning service, there’s a lot of cleaning, sanitizing, and hand washing that needs to be done to prevent children from getting sick. 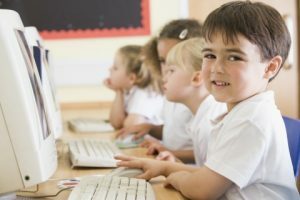 Kids need access to computers for a beneficial education, but being exposed to the computer’s parts is also putting them at risk for getting sick. While the classroom keyboard has 3,300 CFU, there’s also the mouse, computer towers, and tablet surfaces to be concerned about. What’s tricky about keyboards is that they are difficult to clean for time-pressed teachers. The surface of keys, as well as the crevices, can hold a significant number of germs. A commercial cleaning service can’t help clean your student’s hands, but just knowing that they have 1,200 CFU can help you understand the importance of regular surface cleanings. Think about what you touch as you go about your day – door handles, computers, books, water fountains, bathroom handles, faucets, and more – each with germs that are transferred from the surface to your hands and your hands to the surface with each touch. Then think about how often and how thoroughly children wash their hands. Makes you want to carry around a bottle of hand-sanitizer, doesn’t it? A fun learning experience for many schools is having a live animal in classrooms. Rabbits, hamsters, or snakes, the cages are also a surface covered with germs. At 1,200 CFU, it’s the same number of germs as student’s hands. Each time a student opens up the cage, germs are transferred. Not only is this unhealthy for the animal, but for students as well. To ensure that your Chicago school and the students and staff that attend are as safe as possible, a commercial cleaning service can thoroughly clean the most germ-filled surfaces. Avoid sick days and paying substitute teachers with a professional and reliable school janitorial service. To learn more about Geralex and what we can do for your school, give us a call today.